After selecting the application environment and entering the ambient baseline temperature, the user then enters components from a Parts List or BOM onto the appropriate commodity worksheet. 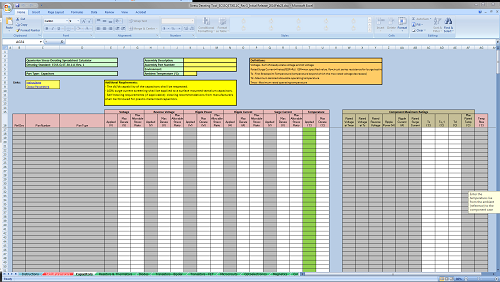 After supplying part type identification, rating and application data, the Stress-Derating Spreadsheet Calculator determines the relevant derating requirement and indicates through a simple Green/Red color scheme, whether or not a parameter is in compliance with the standard. Critical part type data entry is drop-down menu driven, and all user accessible data entry fields are easily identifiable.